We've created a series of 3 powerful lead generation marketing videos specifically designed to help your network of small business owners generate all the leads their business can handle... and do so within 7 days of receiving them. These presentations contain simple to understand, easy-to-apply, step-by-step, paint-by-numbers online and offline tactics that when implemented, have the ability to produce instant and dramatic revenue growth for any small business. But the end result is this. Any of your clients that apply this information will see an immediate increase in their cash flow in just days. Once they see these results for themselves, we want to help them create and implement a world-class marketing program of their own using our revolutionary E-Learning Marketing System... an online business school designed specifically to provide all small business owners with the tools, done-for-you resources and support they need to build a successful business. We believe by proving to them right up front that we can teach them proven and tested lead generation technigues that actually work, they will continue to let us help them build a market-dominating business. If any business owner in your network will simply take the information we send them and apply it to their business, the revenue they will generate will more than pay for the investment in our program by a factor of ten. In short, every prospect will see a huge increase in their revenue BEFORE we ask them to invest in any of our services. We want them to experience first-hand the cutting edge information that will enable them to out-market and out-sell their competition. The content and support they receive in this program is unmatched… and simply off the charts. And since we know that many small businesses in your network are hurting financially today, we found a way to offer them all the tools, strategies, resources and live support they need to become successful… for less than the cost of a daily coffee. If you decide to become one of our Joint Venture partners, we will extend to your members (and on your behalf) up to $5,000 in small business grant money we have just received from an entrepreneurial investment group whose mission is to help small business owners worldwide become successful. We're going to credit you with arranging these grants on behalf of your network so you can pass them along to your members, prospects and clients as a "gift from you to them." We've included a huge financial incentive for you personally as thanks for your partnership and for endorsing us to your members and database prospects. Click the Yes… I'm interested button below and complete our short joint venture application form. We will then provide you with a free lifetime membership just for partnering with us. Let us show you what this unbelievable system is all about and how it can benefit both you and your prospects and clients. Check out the advantages of our cutting-edge E-Learning Marketing System below. Our online system and the done-for-you resources and tools are a total game changer for your clients. we'll point out the forms, tools and templates they need to complete and show them exactly how to go about doing that quickly and efficiently. We have created an entire series of powerful audio recordings that give them a complete overview for each critical marketing and business growth fundamental they need to attract as many clients as they can handle. We have just added more than $1 million in new turnkey marketing campaigns to our Ad Library. Want to see... click here to view our $50,000 Contractor Campaign. Headline Bank - more than 400 of the world's most powerful headlines that can jump-start their marketing and advertising copy. The Headline Bank gives them the unprecedented ability to write eye-catching headlines that transforms browsers into buyers. These headlines make readers stop in their tracks, pay attention to every word of their copy, and click their "Add to Cart" button without a second thought. Sample Letter Library - now they can leverage 59 of the most powerful, results-producing letters ever created. Use them as templates to create marketing that will out-sell their competition. These letters are responsible for driving millions of dollars in revenue to companies such as Newsweek, Time Magazine, Mercedes Benz, Mastercard and Timex. Script Template Library - now your prospects and clients can create the perfect on-hold message, voice mail message as well as develop a receptionist script that transforms their receptionist from a glorified human answering machine into a powerful salesperson and lead generator. ONLY an easy-to-afford monthly payment program so your prospects and clients can get into the program… stay in the program… and give themselves the time they need to make a huge financial impact on their business and their life. The entire E-Learning Marketing System with all the tools, resources, support, videos, bonus content… as well as direct access to us is $197 per month. That's it! We will provide them with direct and unlimited access to the exact same program we charge $25,000 as consultants to deliver offline for $197 per month. Now that's a great deal! We want everyone who receives this offer to recognize it as a gift from you. We want to position you as the "hero" in your network's eyes for making this amazing opportunity available to them. Here's how we'll make this happen. We have allocated $100 of our $197 monthly price point toward marketing expenses. By partnering with you, this is a cost we will not incur. This allows you to inform them that you want to help them build a successful and profitable business, and to do that you're going to cover more than 50% of their cost every month so they can enroll in the program. We will make sure all of your referrals receive this discount on your behalf. By the way, this lucrative discount will remain in force for as long as they remain in our program. We will provide you with an email or a direct mail letter you can send out that will position this discount as a "gift" from you to your members as a thank you for their past patronage to your business. You can edit this letter and revise any content as you see fit. One of the most strongly desired components of our program is the weekly Group Coaching calls which we deliver in a webinar format so they get both audio and video training. We offer these calls, including unlimited access to the recorded webinars for $500 per month... or $5,000 if they pay for the year in full. We have just been approved to receive a significant amount of grant money from an entrepreneurial investment group whose mission is to provide financial assistance to small business owners willing to seek out professional help from certified business growth programs. Our Group Coaching has just received their approval. Therefore, we can offer your entire network the opportunity to apply for these grants to cover the full cost of our Group Coaching option for the entire year. And best of all, the grant remains in effect year to year as long as the recipient remains an E-Learning member. THAT'S IT! NO STRINGS ATTACHED! We want to position this grant as another opportunity YOU are making available to your network. We want you to take the credit for providing your members with this unprecedented opportunity for everyone in your network to receive expert group coaching from professional business growth experts. Bottom line: your members will receive unlimited access to our entire E-Learning System AND weekly Group Coaching for $97 per month. As our affiliate partner, we will compensate you with 40% of the total monthly revenue from every one of your members who enroll in this program… and we will continue to pay you 40% every month for as long as they remain a member. We hope this incentive will encourage you to promote our E-Learning Marketing System frequently to those in your network who may need assistance in growing their business. However, there's also an additional benefit that you receive. Imagine what will happen when these business and marketing growth services begin to generate additional revenue for every prospect and client you have in your database. Naturally they will be grateful to you for helping them become successful, but the best part is they will need your product or service more frequently as their business skyrockets. This means you get their praise, the affiliate commission and an increase in your own business revenue. We always want to benefit our affiliate and joint venture partners. We truly want this to be a long-lasting relationship between us… not a one time, take-it-or-leave it type of offer. You don’t… plain and simple, unless you’re familiar with our programs world-class reputation in the marketing and business growth community. Anyone can say anything these days, and of course they do. Everyone will tell you they can help your prospects and clients… or that they have the best products and services. We believe the proof lies in “RESULTS.” Isn’t THAT what you want for those you refer to us… RESULTS? That's why we created the 3 video series. Click the Yes… I'm Interested button below and let us show you what this unbelievable system is all about and how it can benefit both you and your prospects and clients. 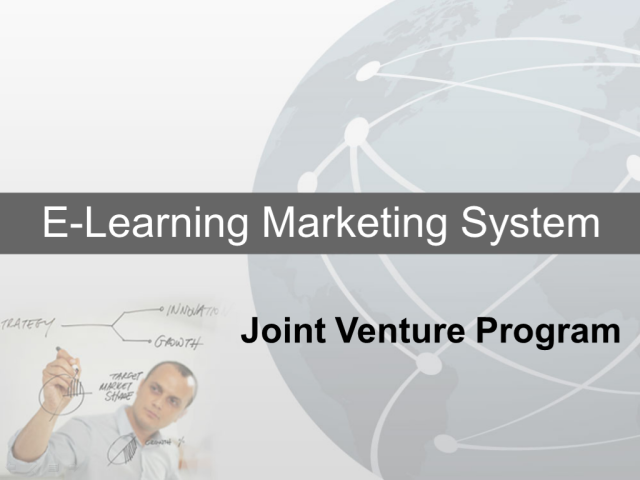 You will also receive a complimentary membership in our E-Learning Marketing System. That's why we've come to you. We want partners who share our values as well as our vision. And remember, your prospects and clients are going to receive 3 free videos that by themselves will make them more than the entire annual cost of our program. ONLY after they receive this world-class content and see revenue coming through their doors will they be invited to remain a member in the E-Learning Marketing System. And we NEVER pressure anyone to remain in our programs… EVER! We believe in empowering business owners with the information they need to make solid decisions, and letting them come to the conclusion that we're the right organization for them to trust with building their business. That's why we want you to experience the entire program for yourself BEFORE you make any final decisions. Your reputation is important to us as well… since it's your recommendation that helps us help the small business owners we value and serve. Your reputation was the key consideration that led us to offer the 3 free videos to prove ourselves upfront… and to add so many high-powered products and services to this program for your members to benefit from. Seriously, have you ever seen any online program this inexpensive with a content lineup this powerful… especially with direct access to experts offering guidance and mentoring in the areas of offline and online marketing and business growth? We've been helping business owners effectively market their business and explode their revenue and profits for years. We'll help your prospects and members do the exact same thing. Encourage your database to get started by subscribing to the free 3 video series. We promise we won't let them down. We have already created the email for you to send out, pending your review and approval. So click on that "Yes… I'm interested!" button right now, check out the 3 videos and together, we'll build your referrals the business of their dreams.